The PB287Q 28" Widescreen WLED Backlit LCD 4K UHD Monitor from ASUS is a 4K ultra high-definition display complete with a 3840 x 2160 resolution, a 1 ms response time, and a 60 Hz refresh rate, making this an ideal monitor for gaming and viewing 4K video. 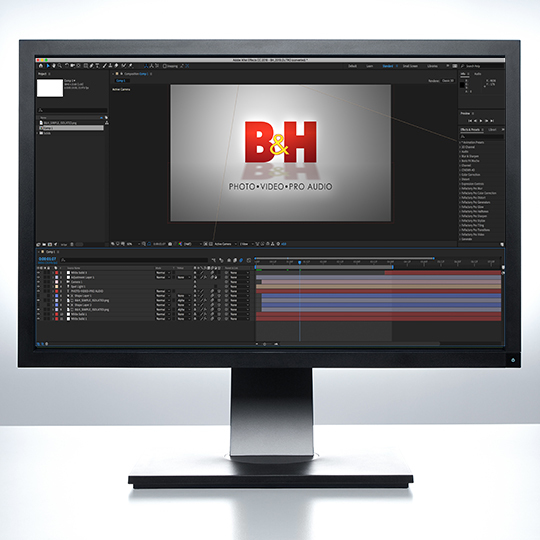 This UHD monitor also supports a 10-bit color look-up table and 157 pixels per inch to enhance color accuracy making it perfect for image and video editing. 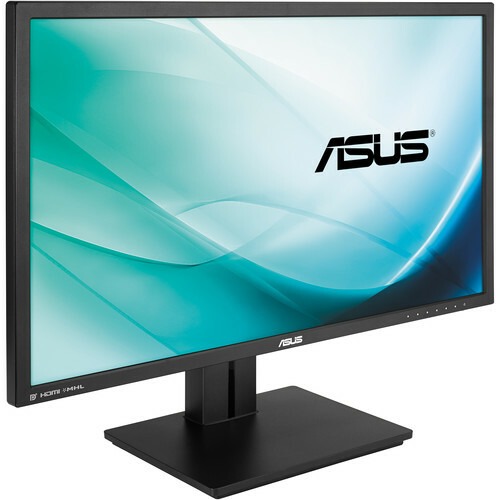 Additionally, ASUS includes their own proprietary image modes including reader mode, darkroom, scenery, theater, sRGB, game, night view, and standard to simplify the process of adjusting the display properties. The PB287Q features extensive connectivity options as it comes equipped with two HDMI 1.4 ports (one supports MHL connectivity), one DisplayPort 1.2 port, one audio in jack, and one earphone jack. Along with the various inputs, this display can support both picture-in-picture and picture-by-picture viewing modes, allowing you to connect two separate sources to the monitor simultaneously. Once configured, this monitor can be swiveled, tilted, pivoted, and the height of the display can be adjusted for enhanced viewing comfort. The ASUS PB287Q True 4K ultra-high definition (4K UHD) monitor features a 16:9 aspect ratio and a WLED panel that delivers next-generation 4K UHD visuals, with resolutions up to 3840 by 2160. With a pixel density of 157 pixels-per-inch (PPI), the PB287Q provides over 8 million pixels, four times the pixel density of standard Full HD displays for enhanced detail, allowing you to experience more onscreen real estate and improved image clarity. The PB287Q also delivers an impressive 1 ms GTG fast response time and a 60Hz refresh rate for ultra-smooth gameplay. With 300% more onscreen space than similar-sized Full HD displays, the ASUS PB287Q gives you more space to spread out your various work windows for more productive multitasking. Capable of displaying 1.07 billion colors, the PB287Q delivers improved color reproduction and saturation thanks to its 300cd/m² brightness and a 100,000,000:1 ASUS Smart Contrast Ratio (ASCR). Real 10-bit colors means the ASUS PB287Q provides smooth color gradations for a more natural-looking transition between hues. The PB287Q also delivers an impressive 1 ms (gray-to-gray) fast response time and a 60Hz refresh rate for fluid and responsive visuals needed to experience today's games to their fullest. The ASUS PB287Q features extensive connectivity options that include DisplayPort 1.2 for true 4K UHD content support at refresh rates of up to 60Hz, one standard HDMI port, and one HDMI port with MHL support. You can also use the MHL with the HDMI connection to view content from your mobile device on the PB287Q while simultaneously charging the mobile device. Built-in Picture-in-Picture (PiP) and Picture-by-Picture (PbP) functionality lets you view content from two different sources simultaneously along with the ability to switch between each video source. PiP mode places the second input source window in one corner of the display, while PbP mode splits the screen down the middle. The PB287Q features ASUS SplendidPlus Video Intelligence Technology that optimizes videos and images by enhancing color brightness, contrast, and sharpness. SplendidPlus features two modes - Reading and Darkroom - in addition to the Scenery, Standard, Theater, sRGB, and Night View modes. Low-blue Light and Flicker-free technologies also reduce the strain on your eyes after long-time usage. Box Dimensions (LxWxH) 30.158 x 18.268 x 8.819"
PB287Q 28" Widescreen WLED Backlit LCD 4K UHD Monitor is rated 4.4 out of 5 by 62. Rated 4 out of 5 by Swig from Great monitor at a good price This is my first 4k screen, detail is amazing! Colors are nice and bright, there is some light bleed around the edges which is really only noticeable when the image is black. I will watch how the development of 4k monitors go as only being able to run at 60 Hz when connected by display port to a compatible video card is a pain when you want to use the monitor with more than one computer and there is only one display port. I use my computer for everything from work, watching movies to playing games. 30 Hz is noticeable on video's and games so i would only recommend for this purpose if you can connect via a display port cable. Rated 2 out of 5 by csborgman from Does not work with Mac Pro @ 60 hz I bought this monitor because of the other reviews and price. Unfortunately I've discovered (personally and other online) that the Mac Pro computers with the D500 or D700 GPUs are not rendered correctly on this monitor at 60 Hz. The issue is a distortion/ghosting running down the right side of the monitor. This is an issue that ASUS, nor Apple for that matter, are interested in addressing since the issue was reported 10 months ago. This monitor works just fine on my 2012 MBP. It also works at 30 Hz but there is a lagging feeling (like a steering wheel with too much play) and watching videos the audio and visual syncing is way off, at least when watching YouTube videos. Boxed up and ready for return. Rated 4 out of 5 by Anonymous from Great monitor for the price This monitor is a great item to have considering the price. I actually own two of them now, had to get the other from a different store as it was sold out here. Highly versatile, plus, once you play a game on 4k, you won't want to play it on 1080p ever again. I'm a big world of warcraft guy and the difference side by side with a full HD 1080p monitor is significant. Make sure you have the video card to run at 4k though, it's pretty intense. Also, a side note with the 4k resolution, most video cards MUST have a DisplayPort on them to actually use 60Hz and will default to 30Hz which with quality is just shenanigans. Another feature I like is the two HDMI AND the DisplayPort. Allows me to plug my computer in to the DP and my xbox one into the HDMI and use the same monitor for both. Rated 4 out of 5 by Anonymous from Good first impressions I have this paired with a 27 iMac as a second monitor. I'm pleased with the screen, the color, the resolution at 4k, and the adjustable stand. My minor issues are how the screen behaves when it wakes from power saver mode...the delay is noticeable and open programs jump back to the iMac before returning to the Asus where I had left them. I briefly had a Dell that woke up almost instantly. Second minor issue is the sharpness at slightly reduced resolution. At 2560 x 1440, it is a little blurry. It seems sharper at both higher and lower resolutions. I'm dealing with OSX, where font sizes are still an issue for me at highest resolution. Rated 5 out of 5 by Zer0 from The must-buy 4K display, full stop. As someone that tends to game a lot on their PC, running both old and new titles alike, as well as games from all sorts of different genres, I needed a monitor that was not only accurate in colors, but above all else, fast. Display lag - specifically, input lag - is a killer. While there are specialized display technologies, such as FreeSync and G-Sync specifically to address these issues on higher resolution displays, the simple matter is the metric used to measure input lag and how quickly a display can process and output the signal as soon as it arrives.My previous primary monitor, of an Acer S211HL, I lucked out on for being a miniscule 10ms of input lag - perfect for handling even competitive grade gaming in even the most demanding scenarios. When searching for a new monitor, I had previously considered stepping down to 1440p, or even 1600p, to better match the graphics card choice. However, none of those were able to keep up with this masterpiece. There is literally nothing on the market, as I am typing this, that has this many pixels, has measured to be this fast, and especially at this price. According to the ------------ database, the closest display with 4K resolution was a curved series of Samsung HDTV's, which sold for $ at the cheapest; even then, their fastest TV is only at 25ms of latency, which will suit most, but not every possible gaming scenario. This Asus, will.That said, if you are like me and decide to pick one of these up, it's important that you remember to do a couple of things when you take it out of the box. Unlike your standard 1080p displays, this isn't as plug-n-play yet.First, use the monitor's Displayport cable. one is provided in the box.Second, in the monitor's OSD, ensure that you select DP v 1.2, to enable a 4K60Hz output.Last, but not least, if you use an nVIDIA card, go into the card's control panel and you'll probably notice it is set at an UltraHD of 4K2K, which is still limited to 30Hz. Going into the PC resolution list to pick 3840x2160, will enable the full resolution and full speed the display is capable of.With that achieved, you will experience the best of this new display, and have the speed you need. At that point, you just need a computer with the graphics power to drive that many pixels. Either way, I am enjoying this new display so thoroughly. At my viewing distance, text and colors are flawless, especially when the monitor is set to sRGB mode. Rated 4 out of 5 by Anonymous from Generally very good monitor This monitor works very well with my MacPro 6,1 though it does not appear to work at 60Hz as I thought it would. The colors are excellent and the display is bright and clear. I use it with Final Cut Pro and Adobe CS6 mainly. My only gripe about it is the on-screen menu, which I found very difficult to use. Surely ASUS can do better. I did have to have my first unit replaced as it would not consistently connect to the MacPro either through DisplayPort or HDMI. My second unit works fine. My experience with customer service was satisfactory. Rated 5 out of 5 by Anonymous from It's A Wonderful World At first I bought a used version of this monitor here on B&H, it it was defective. I sent it back and paid the difference for a new one.This monitor is one you can live with. It has all the right things. 60htz, one of the best TN panels I've ever seen, and the color accuracy is remarkable for the price. The only negative I have to say about it is the control button location, on the back. If you're like me, then this is only a minor inconvience; since once you've setup the screen, you'll amost never touch the controls again.I use this with my Mac Pro 3,1 Octo-core and a GTX-680. My Unengine Valley score is around 1200. Rated 4 out of 5 by Ralaar from A Really Great Monitor It's large, but fits nicely on a desk, and the matte finish on the screen is a nice upgrade from the super gloss mirror I was using before. The brightness and colors are great, and when set to sRGB it is suitable to doing graphics work, especially for the web... however I wouldn't recommend it for doing design for print, I don't believe it's accurate enough for that. The viewing angle isn't quite as wide as I've read in other reviews, but it's wide enough, and there is a fair amount of light spill around the edges... but again it's a fantastic monitor, and the few cons this monitor does have is really the difference between this one at $500 and one without the cons at $1200, so unless you're doing mission critical design work I think the value trumps here.